Over the last four weeks I have given feedback on over 120 projects as a coach for Seth Godin’s radical course, the AltMBA. I completed the course as a student at the end of last year, and this resulted in a disturbing realisation about feedback. Seth Godin describes the AltMBA as a sprint. It is a sprint both in terms of the work you are expected to produce and the amount of feedback you give and receive. Peer feedback, he says is an essential component of the course. As a student in September I read and gave feedback on 5 peoples work, three times a week, for five weeks. So, 75 feedback comments given, and 75 feedback comments received on my work. A feast of feedback. My disturbing realisation was that I had consistently given the other people on the course, more feedback than I give my own team members in a year. I brought this up at a team meeting. Charlotte said she had simply assumed that no feedback was good news – that team members knew I would say something if there was a problem. We are not a traditional team. I don’t have regular supervision with team members, we have a peer-to-peer support partners who talk monthly: two-day team meetings bi-monthly; and I work with my colleagues around strategy and development. I want giving each other feedback – about what we are doing well and how we can keep growing and developing, to become a habit within our team. From me to my colleagues, from my colleagues to each other, from my colleagues to me. I want it to be part of our culture, our DNA. We are a long way from that. I don’t believe in the Golden Rule. Of course I believe that we should always be kind, and respectful to each other, but treating other people at we want to be treated, denies our individuality. I hate playing telephone tag, and much prefer team members to text or email me rather than just phoning to see if they can catch me. Its not that I don’t like talking to people, but I really don’t like seeing missed calls, phoning people back and missing them. Michelle is the opposite and speaks to other team members most days, phoning to see if they are free to talk. To build feedback into our culture, to go from famine to feast, we need to make feel safe. 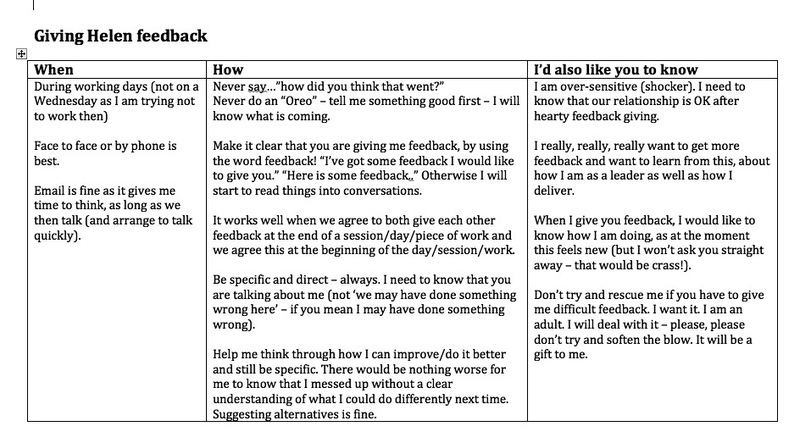 This is easier to write than to do, but a first start is to understand how and when people prefer to receive feedback. You can get ‘how to give good feedback’ information on management courses,, in books, on Google ofcourse. Although there are useful principles to giving feedback, one size definitely does not fit all. 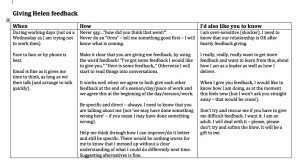 I wanted to learn what getting good feedback meant to each team member. This detail really matters. Rob finished his probation with us last year, and we are delighted to have him in our team. By listening to him describe what good feedback means to him, I realised I had not done a good job. I had given him feedback in the way I would have wanted it – immediately, and directly. Good feedback for Rob meant timing feedback to make sure that he was in the best place to receive it. I am learning about how to ask for feedback too. I realised that I was getting very little feedback too. Every time I have the opportunity to work with one of my colleagues, I tell them that at the end of the day I will ask them for some feedback, on something that I did well, and something I could improve. Great read. Speaking to my wife – who is a teacher the best feedback is ASAP and as close to where it happened. Most teachers take work away mark it in front of the TV and give the books back often days later. ASAP and close to where it happened is tricky for a virtual team. But is there something here for personalising education?